Good morning, writers! At the moment, my Camp word-count is at 2,299. I’m so proud that I’ve written this much already, even if most of it isn’t quite what I had in mind. It doesn’t seem like much, having written just over 2K in a week – but for me, that’s fantastic. Like I said in this post, I’ll be posting my own fictitious, unedited writing throughout the month. (That’s a big deal for me, a writer who doesn’t like to show her work to others.) So today I will be posting my favorite excerpt from my April story, Stranger to Sunshine! All I ask is that the excerpt is no longer than 800 words, to prevent lag for those of us with slower computers (like me). Obviously, keep it clean as well: no colorful language or inappropriate scenes here! So without further ado, here is a rough-as-heck, totally unedited excerpt from Stranger to Sunshine. Please note that while this story has no publishing in its future, the concept and writing still belong to me! Brief synopsis: Imagine a world without sky, without livestock. Where the color green is unknown to most, there is no water, no night and no day. A world in which time is illegal, ages are forbidden. A world owned by technology. I looked up, a bit startled. We scarcely received any customers, let alone graying men with armor along their shoulders. “Tea,” I said, flatly. Isn’t it obvious by the hand-painted teapots in the window? Ro painted them. He’s a lovely artist. A lot of people assume I’m the one behind the brush, but no: I’m just the woman who builds illegal machines. I blinked. It took me a moment to realize he was, indeed, speaking to me. I walked around my counter and moved toward him and the shelves, but not too close – I’d been in this business long enough to know not to get cozy with the customers. I was only here to sell to them, not to be their friends. Stoker was saying something, but I wasn’t paying attention. I retrieved a delicate teacup from the bottom shelf: it had a slight pink tint, and it was streaked with blue and red watercolors. Its rim was painted shiny gold. Ro painted it while I road on the Missile train for the first time. “Do you like it?” said Stoker, eyeing me. Suddenly I realized he was looking a few inches to the left of my face. “Perfect.” Stoker held out his hand, and I placed the cup in his palm. He turned it over, running his finger along the rim, the handle, the base. A smile spread over his face. I’m ashamed to admit, my heart leapt a little. I was never invited to anything. The only wedding I had ever attended was my own. I felt myself swell at his offer. “I will be there,” I promised. Now it’s your turn! Share your story below, following our two guidelines: a) keep it shorter than 800 words, and b) keep it totally clean. What an exciting story, Sam! From the premise and exert, it sounds like a winner! (But what else can I expect from you? 🙂 ) I can’t wait to hear more! Thanks for all of that, Makenna! 🙂 Your feedback means a lot to me. Hopefully that helped. If not, there are a ton of articles on Pinterest for first chapters/starting sentences that I reference a lot. 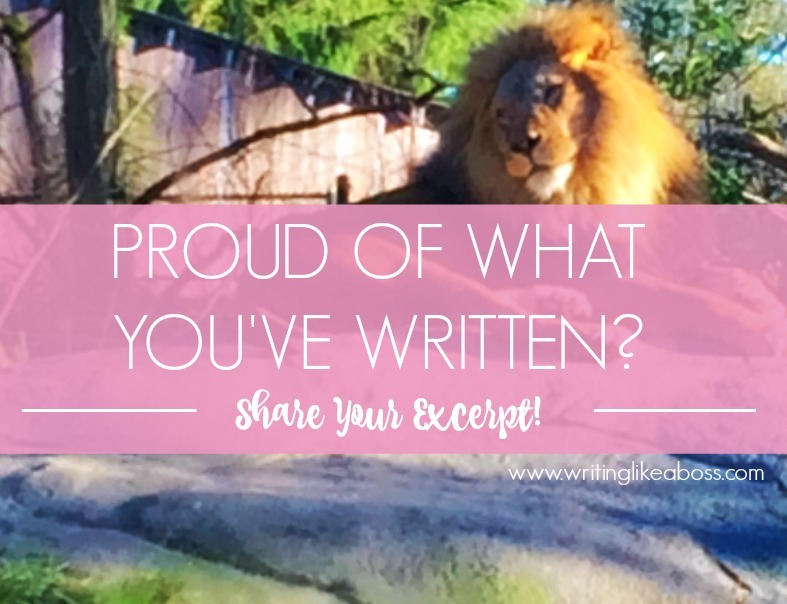 I would love to read your story excerpt, if you still want to share it! 🙂 Good luck with that story!